Have you ever had one of those days where you just can’t decide which smoothie you want to make? I was having one of those days recently, and couldn’t decide between a raspberry smoothie and mango smoothie. Both sounded so delicious! I finally decided to make a layered smoothie using both! This layered smoothie reminds me of a summer sunrise from the colors. You can layer it more than just once like I did to make it look even nicer. Feel free to add in some fresh fruit. 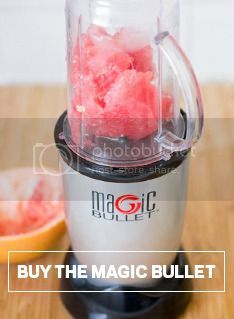 I use frozen fruit during the summertime when it is warm outside because it makes the smoothie cold and slushy. Enjoy! Add 1/2 banana, all of the raspberries, flax seeds, half of the orange juice and half of the yogurt to one Magic Bullet cup. Add the mango and remainder of the yogurt and orange juice to another cup. Blend each smoothie until well blended, then pour the mango smoothie into a tall glass followed by the raspberry smoothie.